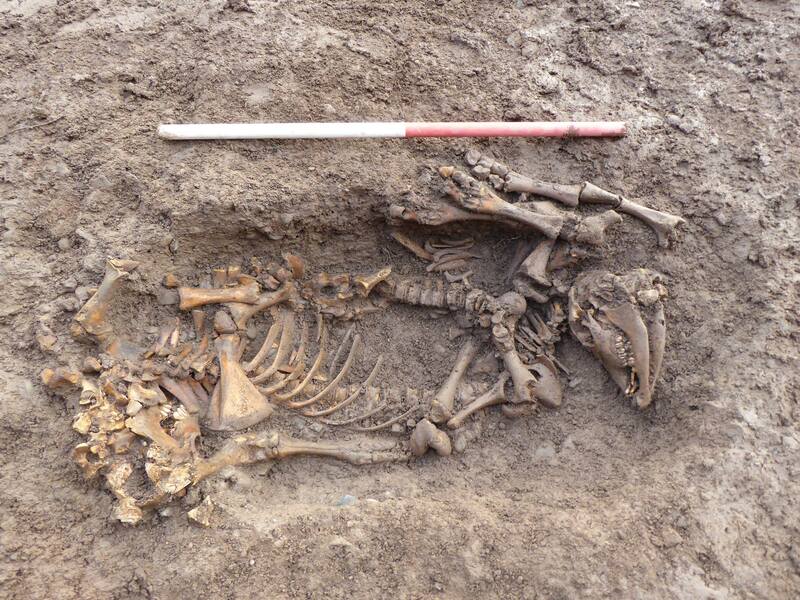 An excavation around a medieval church in Sutton Farm, Shrewsbury, has unearthed the remains of a previous Anglo-Saxon church and a series of unusual animal burials that may be pre-Christian. The Church of the Holy Fathers, as it is now known, was bought from the Church of England by the Greek Orthodox Church in 1994. Built in the late 12th, early 13th century, the church had been abandoned in the late 19th century and was being used as a storage shed. The Greek Orthodox Church restored the nearly derelict Grade II-listed building and a congregation has worshipped there ever since. The field on the west side of the church is slated for development — it will be a parking lot for a 300-home estate — and a team from Baskerville Archaeological Services was contracted to excavate the site before construction began. By the terms of the planning contract, developers Taylor Wimpey funded an archaeological survey of the parking lot site from late summer until November. The Greek Orthodox Church stepped in to fund an extension of the excavation and developers gave the archaeologists more time to explore the site. They were able to unearth foundations of the current medieval church extending 20 feet from the modern-day walls, indicating that this small church was once much larger. Next to the medieval foundations and between 15 and 18 inches deeper under the soil, archaeologists found the stone foundations of an earlier building which they believe to be an Anglo-Saxon church. Several artifacts were discovered in a rubble pile: three garnet pins, a carved stone of indeterminate age and two coins, one of them a Charles I half farthing minted between 1624 and 1635. 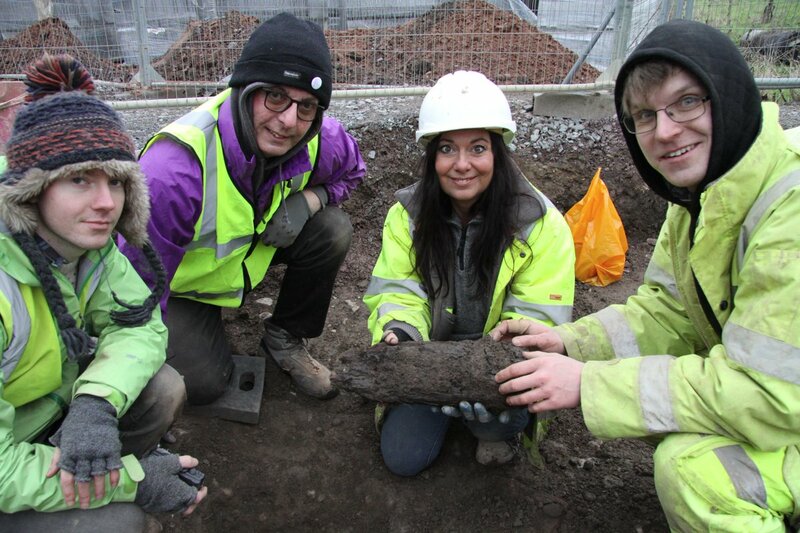 The very last day of the dig on the west side, the team unearthed a 15-section of a wooden post, likely a door post, in the layer believed to be Anglo-Saxon. This was a key discovery, because wood can be radiocarbon dated to confirm or deny whether the earlier structure does date to the Anglo-Saxon period. 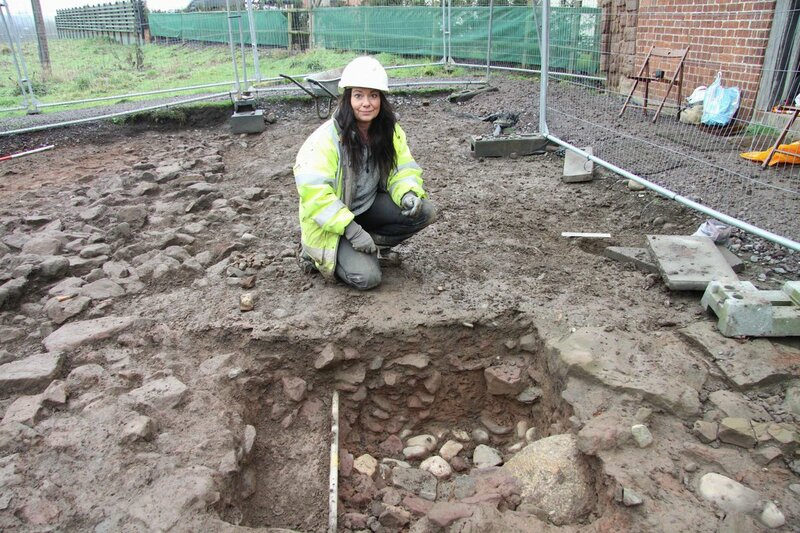 On the south side of the church, archaeologists found more foundations of the medieval church. These indicate the church had a transept, the arms on either side of the nave that form the traditional cross shape. They also discovered the medieval graveyard. The remains of three people were unearthed, including an intact skeleton of a woman buried in shroud, but that’s to be expected in a churchyard. Less expected were the elaborate animal burials: the skeletons of a calf and a pig carefully posed together with yin-yang symmetry, a Stone Age flint found between the ribs of the calf, the skeletal remains of a pig laid to rest in a leather-covered wood coffin, the bones of a large female dog that died during whelping found next to the bones of six chickens, a pregnant goat and what appear to be the bones of one more dog and a large bird. Those last two have yet to be fully excavated. Green thinks these are likely pre-Christian burials. The bones will have to be carbon dated before we can know, and it doesn’t look like they have the budget for it at this point. They’re working on it. The parking lot is still going forward. Taylor Wimpey have agreed to seal the medieval foundations under a geotextile membrane before pouring the asphalt. This will protect them from damage and make them more easily accessible should someone in the future pick the archaeological remains over the parking lot. Meanwhile, the excavations on the south side of the church will continue. 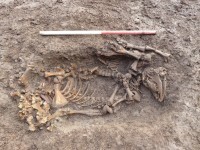 The remains, both human and animal, will be reburied at the church in a special funerary service.